Bruising usually occurs as a result of an injury and involves a release of blood from the capillaries into the tissues under the skin which produces a dark mark. As blood is absorbed by the tissues and carried away the bruise begins to fade. We can help to protect these capillaries and prevent bleeding by ensuring we are not deficient in important nutrients such as Vitamin C, Vitamin K, Vitamin E, Zinc and Bioflavonoids. Bioflavonoids can be found in foods such as broccoli, citrus and capsicum and are natural anti-inflammatories. Some people bruise easily and although there are many possible reasons it is commonly due to a Vitamin C deficiency. This may be due to the fact that many people are not consuming enough fresh fruit and vegetables or due to a higher demand because of high stress levels or compromised immune systems; in this situation supplementation is often required. Comfrey has been traditionally used to treat bruises and helps to reduce swelling as well as promoting the growth of tissue, bone and cartilage. As there are some safety concerns surrounding the internal use of comfrey, a cream or oil can be applied to the skin liberally. St Johns Wort has also been used throughout the ages to speed up the body’s healing response, along with Arnica, which has great pain-relieving and anti-inflammatory properties. Arnica can be taken homeopathically as pillules, tablets or as a spray, however its topical use as a cream can also bring speedy relief. 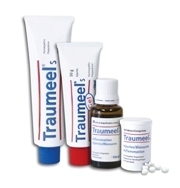 Traumeel is a European product which contains a combination of homeopathic remedies, including Arnica, which are specific for bruising, soft-tissue injuries & any inflammation in the body. Witch Hazel can be applied as an effective blood dispersant and also had anti-inflammatory, antiseptic and astringent properties. 1. Wonderfoods Vitamin C with Hesperidin Powder (200g) OR 1/2 tsp in water x 3 daily. 1. Herbs of Gold Vitamin C 1000 + Zinc and Flavonoids (60 Tabs, 120 Tabs) 1 tab x 3 daily with meals. 2. Traumeel Cream (50g) Apply generously and reapply as needed. 3. Martin & Pleasance Comfrey Cream (100g) Apply to area of break (as long as there is no broken skin) 3 x daily. 4. Brauer Arnica (Pillules & tablets) OR Adult: 2-4 tabs under tongue every 1/2 hr for the first 4 doses. Then, 2-4 tabs every 4 hours. Child: 1-2 tabs under the tongue every 1/2 hr for the first 4 doses. Then 1-2 tabs every 4 hours. 4. Traumeel Tablets Adults and children 6yr + - 1 tab dissolved under tongue x 3 daily. Infants and children to 6 years: 1/2 the adult dose. 6. Thompson's Grape Seed 19000 (60 Tabs) 1 tab x daily with a meal. 7. Herbs of Gold Quercetin Complex (60Tabs) 1 cap x 2 daily.